It’s no secret, I LOVE PIZZA. I really could enjoy it every day of the week for the entire calendar year. Trouble is, I live here in Italy where there are so many other delicious menu choices. I know, I’ve got it bad, real bad. Still, if forced at gunpoint by a Mafia hitman to choose among all the food types out there, pizza wins, hands down. Why do I love pizza so much? Because it’s the easiest dish for me to pull together in the galley. It’s a never-can-miss recipe that keeps getting better and better as I continue to tweak it as I go along. And that brings me to the focus of this homemade pizza primer post, the jars that make my pies pop. Not just any jars, but glass jars filled with exciting pre-made sauces readily available at my just-around-corner Despar supermarket. 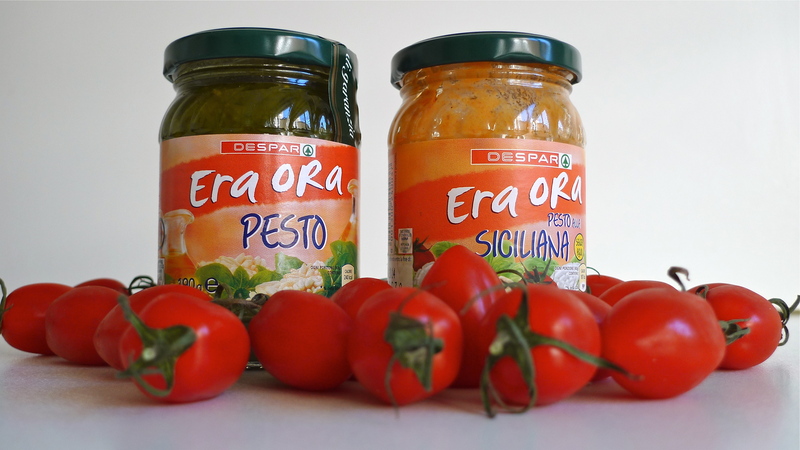 They’re labeled Era Ora (It’s about time), and two from this line routinely make it onto the flatbread: Pesto (the signature sauce of the Liguria made primarily of crushed basil, olive oil and pine nuts) and Pesto alla Siciliana (tomato based with lots of herbs and spices popular around the island). Used primarily in pasta dishes by Italians, I find the Era Ora sauces perfect for the pie as their rich thickness spreads out nicely and evenly, elevating my homemade versions to a whole new level. Their various flavors just beg for the pies to be paired with wine — red, white or rosé. 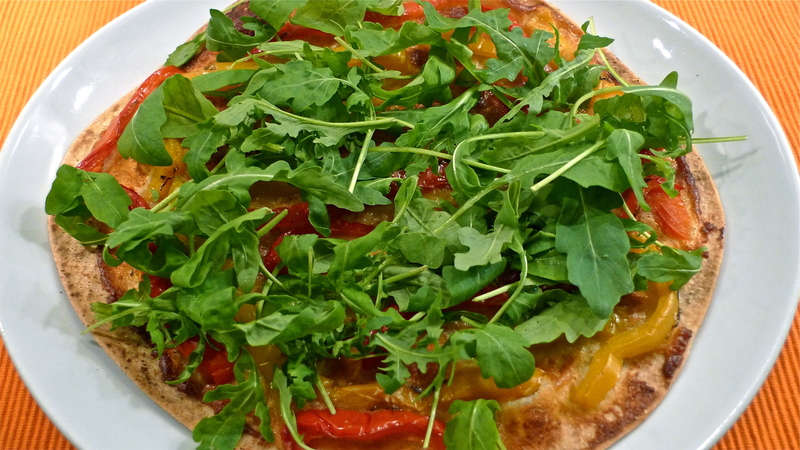 Next time you’re at the market, add some flatbread pizza ingredients to your shopping list. Cruise the aisle filled with international products. 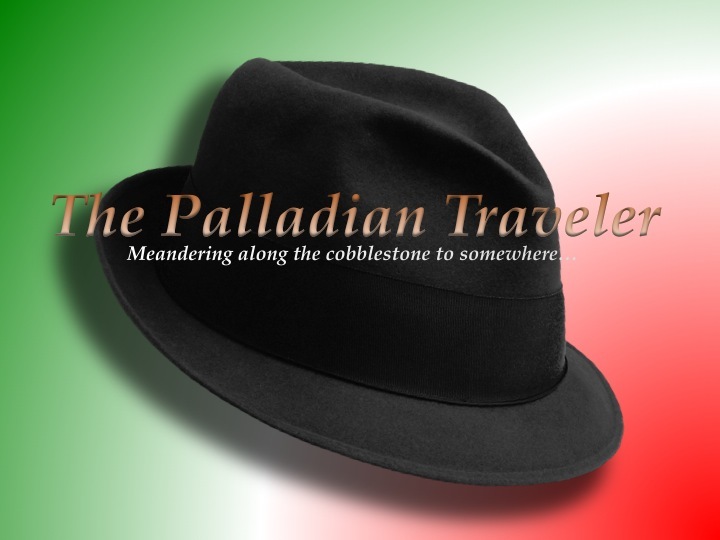 Look for Italian flatbread, Indian naan (garlic version preferred) or Mexican burrito-size whole wheat flour tortillas; or, look for fresh pizza dough in the bakery section — if rolled out super thin it becomes flatbread. Next, run a sweep of the sauces available, mindful of those in glass jars, not cans, that are a cut above the routine, bland and runny tomato sauces. If successful in filling up your grocery tote, you’re off to a good start in getting closer to creating your own flatbread pizza right there in your kitchen. All that’s left is the fun part, deciding which toppings to add to finish off the pie: bell peppers, zucchini, fresh tomatoes, olives, salami, ham, arugula (rocket leaves), etc. If you like pizza half as much as I do, you really owe it to yourself to give it a go and create your own signature flatbread version. Let me know how it turns out. 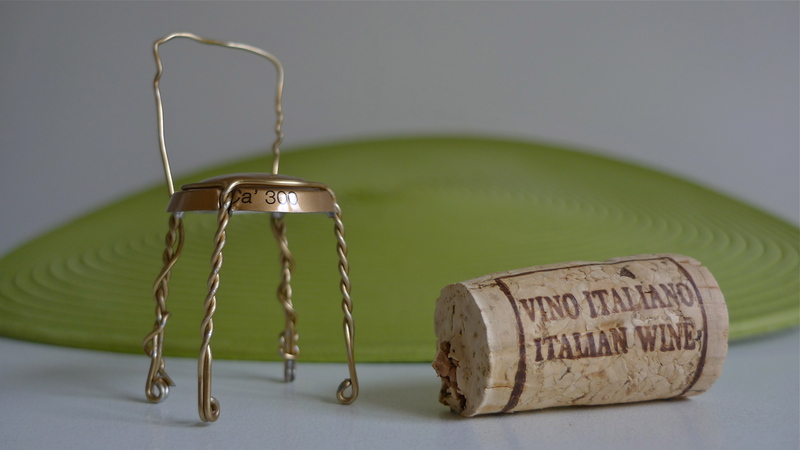 BUONA FORTUNA e BUON APETITO! Pure io la mangerei 7/7, mattina e sera ! why am i suddenly hungry for flatbread pesto pizza?!!!! Ah, yes! Actually, I like the idea of using a simple pesto or spaghetti sauce for for a flatbread topping though superior quality is the key here, as you say. Another for the list for when I get back to Oz! Marvelous, marvelous, marvelous! and, YUM! I love your “on-the-level” photos of the pizza. They really make the pizza attractive to me! Pizza is one of my favorites. 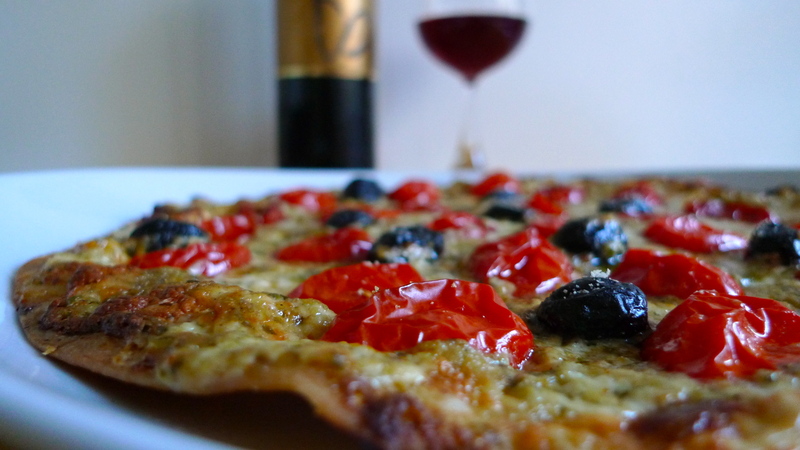 One of the best pizzas I ever had was at a little bar in Gavorrano, Italy. I don’t know if it was because I’d been traveling all day, was really tired, and starving, but it was soooooooooooooo good. TSC — Probably because it was GOOD. Maybe being tired and hungry made it that more delicious. 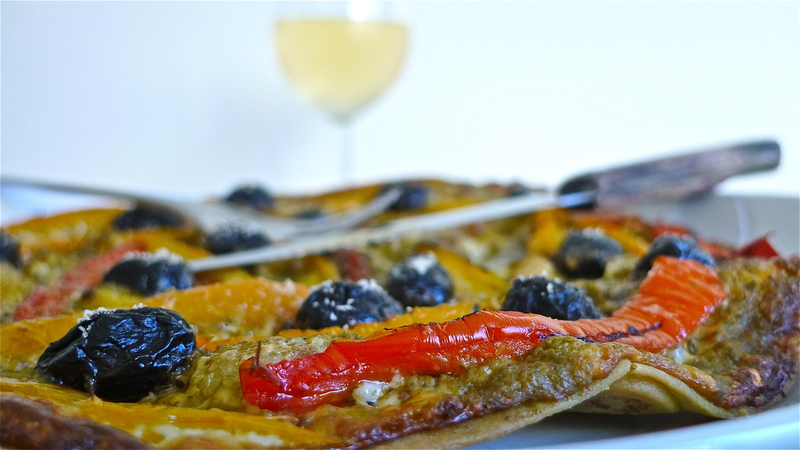 My latest go-to party appetizer is pizzettas made with pastry dough as the base. They’re light and flaky crust which I top with fresh tomatoes, mozzarella and fresh basil – always a major hit!! Tina — I thought you didn’t cook? 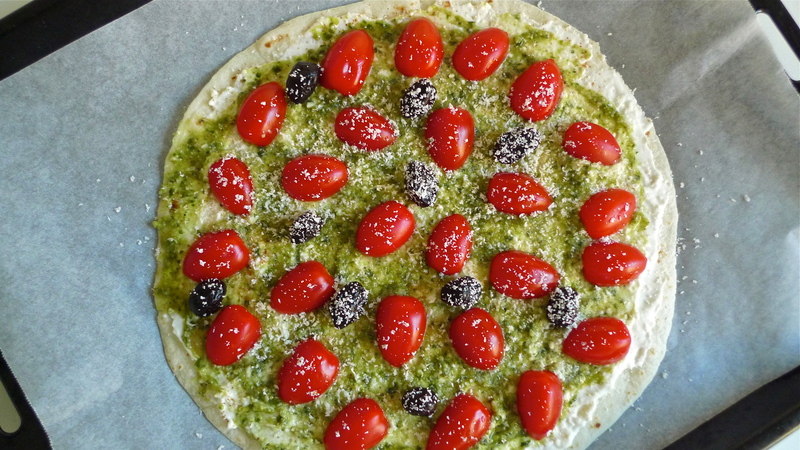 Glad to see you can whip up a batch of “pizzettas” — actually, little Margherita with the red, white and green colored toppings — in the galley. I’ll bet they taste delish. Share some photos next time you give it a go. That’s a great idea! I love pizza as much as you do. It actually is quite nutritious. Assuming it’s not full of pepperoni and sausage.